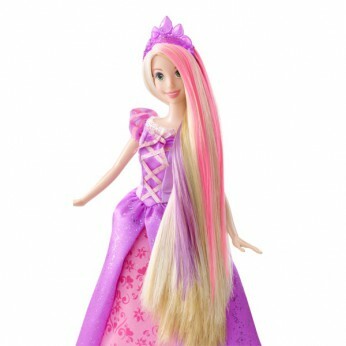 Girls will be delighted to colour change Rapunzel’s long blonde hair – while they brush it! The innovative brush holds the magic. Just fill with icy cold water, close the compartment, then brush. It’s magical colour change without the mess! Add pink and purple streaks, design patterns and style. Girls’ can also use the tip of the brush to stamp Rapunzel’s hair with coloured shapes. The colour magically disappears for endless playtime fun. Dolls cannot stand alone; One supplied; Size H32.5cm; For ages 3 years and over; EAN: 0746775179595. WARNING(S): Not suitable for children under 3 years old. This toy costs approximately £19.99 (for the latest and best prices make sure you check our retailer list for the Disney Princess Color Change Brush Rapunzel above). In our review of Disney Princess Color Change Brush Rapunzel we classed it as being suitable for ages 3 years, 4 years, 5 years but recommend you check the manufacturer specific advice before purchasing.